How to access and write private notes regarding an employee. To help you keep private notes regarding an employee, you can use the Notes section of employee profile. Whether to keep a record of daily achievements that contribute to their career progression, to note certain highlights of an employee's behaviour, or anything else you would like to have an official record of. Navigate to an employee's profile and click on the Notes tab. Click inside an empty field to start typing the note. Once done, click Submit and your note will be automatically saved. Important: The Notes tab is only visible to the super admin of the platform by default. You can also give additional permissions to other employees, for example managers, under the Roles & Permissions section of your Company Settings. To delete an existing note, hover over the note and click on the recycle bin icon on the right-hand side to remove it from an employee's profile. 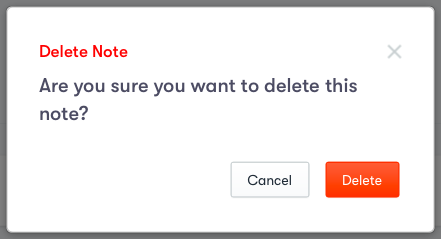 In the modal screen that opens, confirm the removal of the note by clicking Delete.